My home screen says 'fat' - what about yours? My home screen says ‘fat’ – what about yours? It struck me the other day how closely my home screen mirrors the current focus areas of my life. 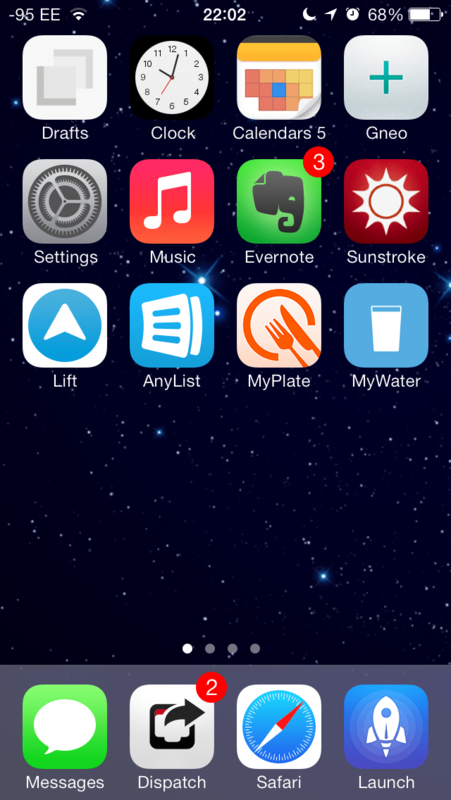 At the moment, my home screen has been stripped of its usual occupants (Netflix, Echofon Pro and Riposte) and replaced with the apps that are supporting my fitness kick: Lift, MyPlate, AnyList and MyWater. I suppose I shouldn’t be surprised that you can tell a lot about me and what I’m focused on at the moment by looking at my home screen, but it was a scary moment. I’ve recently decided to get my act together fitness-wise, and in doing so I dredged up my long-time preferred food diary, MyPlate. I’ve found diarising my food intake to be the most effective way of helping me eat healthily and lose weight, and I’ve always found MyPlate an easy app to use. Lift: I posted about my experiences with Lift last week, and my affection for this app grows. As I get more into my habits, I’ve continued to add more and they are proving to be a simple but powerful motivational tool. I’ve also connected with a few ADN buddies and we’re forming quite the little support group, which I’ll report back on in a few weeks. MyWater: This app was actually suggested to me by the MyPlate App, and initially I wondered why I would bother when I can already track my water consumption inside MyPlate. But then I downloaded it, and was quickly hooked by its simplistic ‘glass half full’ visual that allows you to set a target amount of water to drink and allows you to record each drink quickly with a simple swipe up. It then integrates neatly with myplate via a simple icon, which sends your current water total to MyPlate via URL scheme. I’ve found that these four apps, working together, have become my core ‘fitness suite’. For now, whilst my focus is on losing my 2013 beer gut via diet and light exercise, they will suffice. When I’m a bit closer to my target weight and start focusing a bit more on fitness, I might throw a fitness app into the mix too. Adding these apps to my homescreen has put front and centre my focus on getting back into shape. What does your home screen currently say about you?